The largest and strongest Snow Guard available on the market today! Made from tough polycarbonate material for optimum performance and durability. Unique ledge for shingle type applications. Three large structural ribs for superior strength. 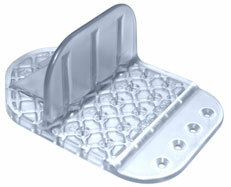 Exclusive waffle design tread on the bottom for maximum holding power. Clear Glacier Snow Guards are practically invisible. With over 30 inches of base coverage, the Glacier Snow Guard has surpassed the competition. This ensures secure holding and reliability. *Special* Glacier Snow Guard Pricing: $3.49 ea. Custom colors available at an additional charge.